Calendula aegyptiaca var. microcephala Boiss. Calendula arvensis f. alata Heyn & al. Calendula arvensis var. bicolor Batt. Calendula arvensis var. parviflora Willk. Calendula microcephala Kral. ex Rchb. Calendula persica C. A. Mey. Calendula undulata J. Gay ex Gaud. Linnaeus, C. 1763. Species Plantarum, ed. 2, Tomus II: 1303.
International Plant Names Index. 2017. Calendula arvensis. Published online. Accessed Dic. 22 2017. The Plant List 2013. Calendula arvensis in The Plant List Version 1.1. Published on the internet. Accessed: 2017 Dic. 22. Tropicos.org 2017. Calendula arvensis . Missouri Botanical Garden. Published on the internet. Accessed: 2017 Dic. 22. Hassler, M. 2017. Calendula arvensis. World Plants: Synonymic Checklists of the Vascular Plants of the World (version Mar. 2018). In: Roskov Y., Abucay L., Orrell T., Nicolson D., Bailly N., Kirk P., Bourgoin T., DeWalt R.E., Decock W., De Wever A., Nieukerken E. van, Zarucchi J., Penev L., eds. 2017. Species 2000 & ITIS Catalogue of Life. Published on the internet. Accessed: 2017 Dic 22. USDA, ARS, Germplasm Resources Information Network. Calendula arvensis in the Germplasm Resources Information Network (GRIN), U.S. Department of Agriculture Agricultural Research Service. Accessed on 07-Oct-06. 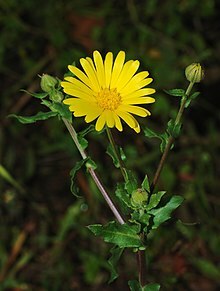 For more multimedia, look at Calendula arvensis on Wikimedia Commons. This page was last edited on 28 March 2019, at 08:28.